An Englishman in Colombia: I am Wrecked! 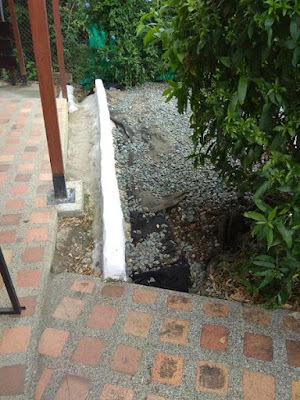 I purchased the parts over the last couple of days, today was the time to start work...On a land-drain, the garden slopes down towards the house, also there is a lot of land movement on the mountain, especially over the last twelve months due to the amount of rain we have had. It was time to give the house a little more protection, whether it will work is another matter, but I can say I tried. I started with the 3" tube I am using, there is no going out locally and just buying perforated tube for the job, you have to do it yourself. So the other evening out came my drill, and I put two lines of holes in what will be the bottom of the tube, as water rises, so hopefully it will enter the tube from below and flow away. 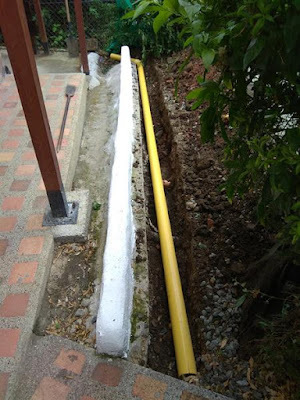 I had to make the decision, was I going to lay my land-drain on top of these pipes, or dig down and go under them. At this point the trench is 10" deep, and 7" to the top of the pipes. After more thought, I realised I couldn't take the pipe 3" lower, otherwise I would have problems at the other end, getting rid of the water. I completed the trench with a slope towards, what here, is the bottom of the photo. 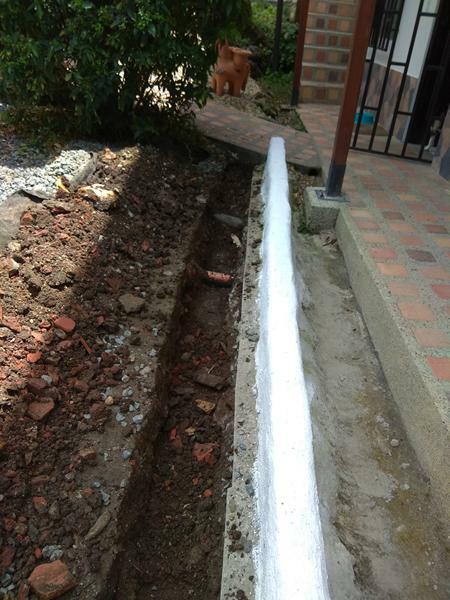 I cut the pipe to length, about 4.5m, dry fitted the pipe to make sure it would fit, and be deep enough not to get damaged. I then glued the fittings together, putting an end cap on the highest end, to stop it filling with dirt and stone, at the other end I put a 45º fitting, to take it round the end of the wall, into the channel, followed by a shorter piece than you can see in the photo. Once that was done, I removed the pipe, and cut geotexil to fit the trench, with sufficient to come up each side of the gravel and cover it. That done, I put the base layer of gravel in the trench, to the height of the septic pipes, seated the new pipe, and then back filled the trench with gravel, making sure the pipe was totally buried, and still have a sufficient slope, but before I could do so, I had to bag, and move the soil and brick, I had removed, as it was in the way. The geotexil was then tucked over the trench to protect the gravel from dirt, and some more gravel placed on top to stop it blowing about. It was my intention to complete the job today, but that involved wheelbarrowing ten to fifteen sacks of gravel from the Suppliers next door, and as good as my homeopathic pain killers are, they are not a miracle worker, and my back was wrecked, it was time to stop before I did some serious damage. 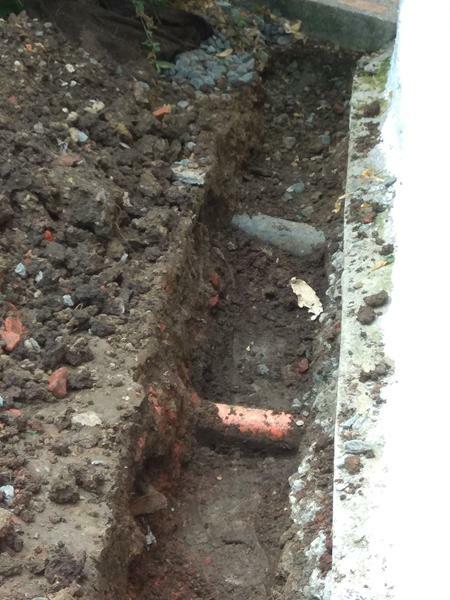 The drain is now in position, and should work, the soil and clay was wet that I dug out, so it should be deep enough to do the job, the water goes into the channel, and over the end wall, to where I won't say, lets just hint that the neighbours won't be too pleased! I will get the cosmetic gravelling done over the next day or two.